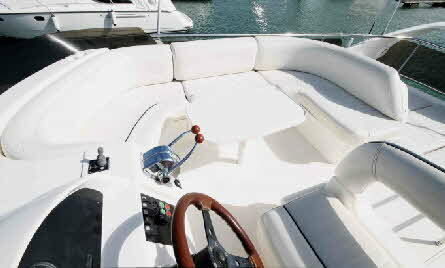 Cream Leather Upholstery, light Cherry woodwork with new Berber Carpets and Blue Covers. 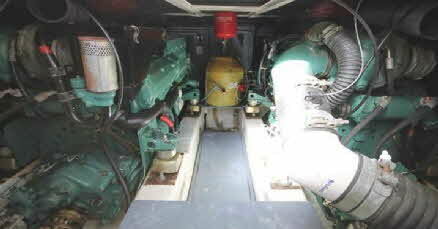 2 x Volvo TADM 63 Diesels on Shafts (1030 hours), Rope Cutters, Bow Thruster, Concealed Hydraulic Crane, Eberspacher Heating, Generator. 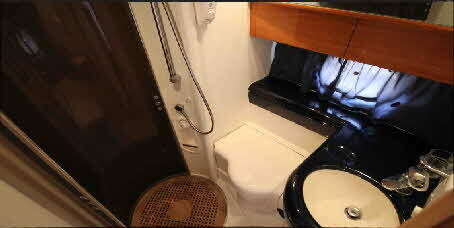 Double En-suite cabin, Twin En-suite cabin / day heads and occasional double berth in saloon. 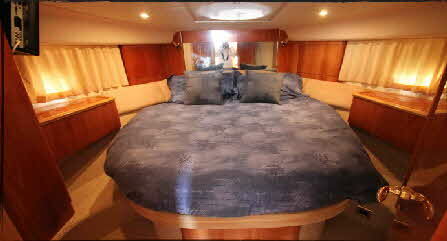 Large open galley and Spacious Saloon. Teak Cockpit Floor and bathing Platform. 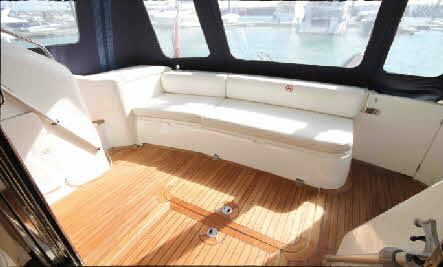 Flybridge with seating and sunpad. 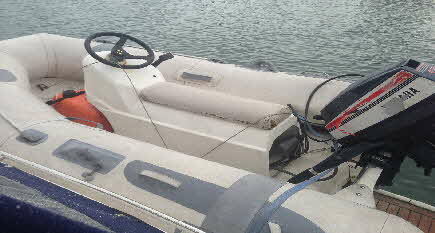 Avon Centre console RIB and 15HP Yamaha outboard. Colour plotter and radar on both helms. Navtex, Dual Station VHF and DSC. ILS Receiever, ipad Wi-Fi navigation link to Isailor. 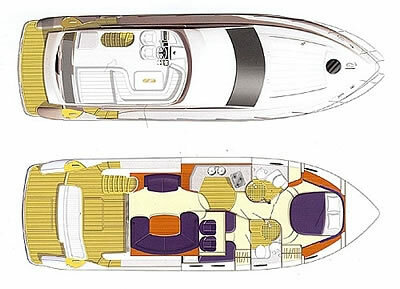 Spacious lazarette, Liferaft, Dan Buoy, Lifejackets, Warps and Fenders. A Princess42 lookalike at a fraction of the cost. 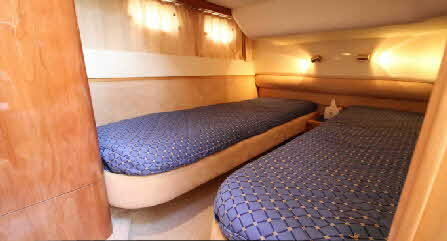 Master Cabin with Double Bed, Two wardrobes, Two Drawers, access to Private En-suite WC and Shower, Two Portholes, Ceiling Hatch, Flat Screen Freeview TV, vanity units with mirrors, 240 Volt Socket, Heater Outlet, Beige Berber Carpet..
Twin Cabin with two Single Beds, Wardrobe, Bedside Cupboard, Direct Access to WC and Shower, Two Portholes, 240 Volt sockets, Heater Outlet, Beige Berber Carpet. 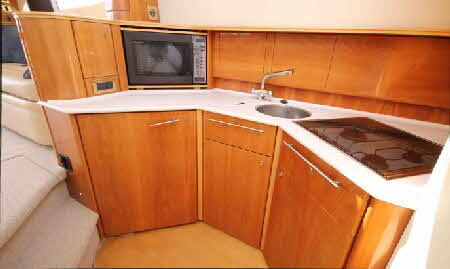 Galley with Twin Sink, Hot and Cold pressurised water, Refrigerator with freezer compartment, Combination Oven / Microwave, Gas Three Burner Hob, Ample Cupboard Space with built in Cutlery Drawer and Waste Bin, Fire Blanket, Light Wood Floor by work tops and Beige Berber Carpet, Full length Mirror on passageway wall., 240 Volt Sockets. Access to WC/ Shower. 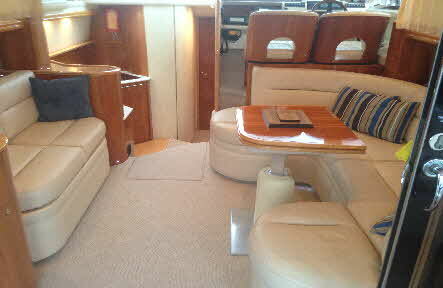 Saloon with Cream leather U -Shaped Sofa and Two Seat Sofa, Light Cherry folding Table, Cupboards and Drawers, step up to helm with two cream leather seats, Flat Screen TV, Freeview & DVD, Mood Lighting, Stereo/CD Player , Heater Outlet, 240 Volt Sockets, Beige Berber Carpet, Double Sliding Patio Doors opening on to cockpit. 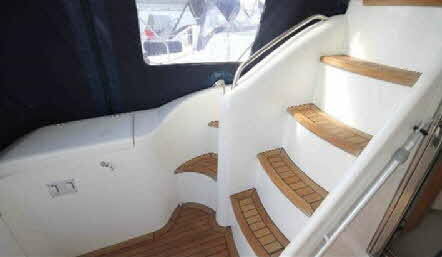 Cockpit with bench seat, locker space beneath seats, Lazarette hatch, Engine Room Hatch, Teak laid FloorTeak and Stairs to upper Flybridge Deck, Crane controls, rope lockers and access to bathing platform, Blue Sumbrella Covers. Bathing Platform with Teak Laid floor, removable mountings for RIB, concealed Hydraulic Crane, Swim Shower and bathing ladders. 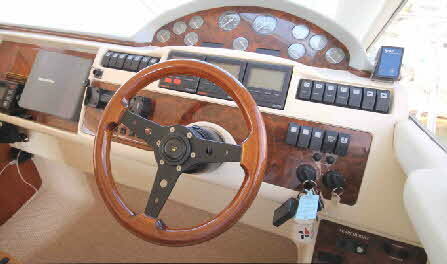 Avon RIB, Center Console Steering, 15HP Yamaha. 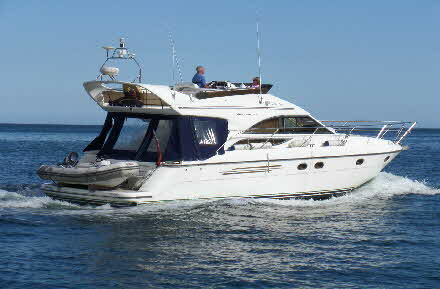 Please contact John on 07770 888484 or email john@jsbmaritime.com If you are interested in viewing this boat.